I find it troubling to see old photos being sold at garage sales and flea markets for decoration. I insist on reuniting them with a family member, or at least a researcher who knows who they are. But, since God only gave me 24 hours each day, I have to restrain my purchases to 1 per sale, and only ones with names written on them. Oh, and one other small rule: No Smiths, Jones, Browns or other common names - sorry, it's just simple physics folks. Ok, you're suspicious right? Why do I do this? Do I hold interested researchers hostage by selling them back at a high price? NO! 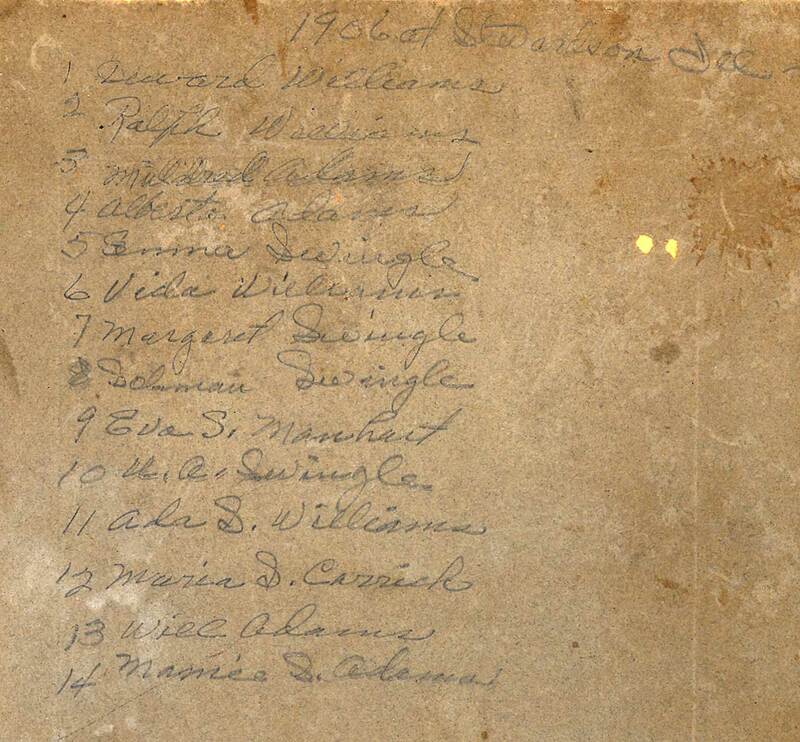 If you can prove you are a genealogy researcher actively documenting these families, I will give them to you free. One day, someone will do the same for me and the cosmic genealogy circle will be complete. This picture find meets all my criteria. I found it in an antique store in Georgetown, TX, July 2009. Written on the back is the person's name, location and a date. Joe Niel - or - Joe Neil - Columus Ohio - August 1888. I found this one at an antique store in Abilene TX, Oct 2010. It was taken "about 10 o'clock last saturday night" :) The back says "No. 1 An old pal" and "No. 2 Dewey Compton" but it may be "Comption" or "Comptron". No 2 is also identified as "Roland Barnard". Dewey is holding a banner that says "Cotton Palace Waco Texas". Bought at an antique store in Gladewater or Mineola TX May 2009. This picture has the Ned Smiley's name on the back. Also is written "1-35 dup" "Oil City Boiler Works", and another word I can't make out, something like "tecesa". I have a second photo like this and it says 1908 on the back. Bought at an antique store in Gladewater or Mineola TX May 2009. This picture has the names on the back and is in pretty good shape. I think there were more pics of this family for sale. A quick search shows this family might have been from Manitoba Canada. Bought at an antique store in Gladewater or Mineola TX May 2009. This picture has some strange writing on the back. This large, wonderful, old photo was found at an antique store in Noonday TX, March 2009. The back has a title and all of the names. ?? ?ina Thompson, Mattilda Alatalo, Dorothy Seay, Arlie May Carney, Ruby Eastey, Addie Reynolds, ?? ?na Jowell, Virginia Hicks, Margie Marshall, Ella May Cornelison, Elizabeth Stump, Alice Reynolds, ?uby Yunter, Ethel Adams, Seity, ?.W. Blessing, C. R. Adams, Thos Yobar, Louie Hicks, Essie McClung, Fla Shiney, RN, G. Maggie Flewbarty, N. Mc Grand, L.S. McClung Captain, Mand Harry McGrand, Oina McSivally Chaplain, Yatsie Sannk Ginduclor. This is one of my best finds! 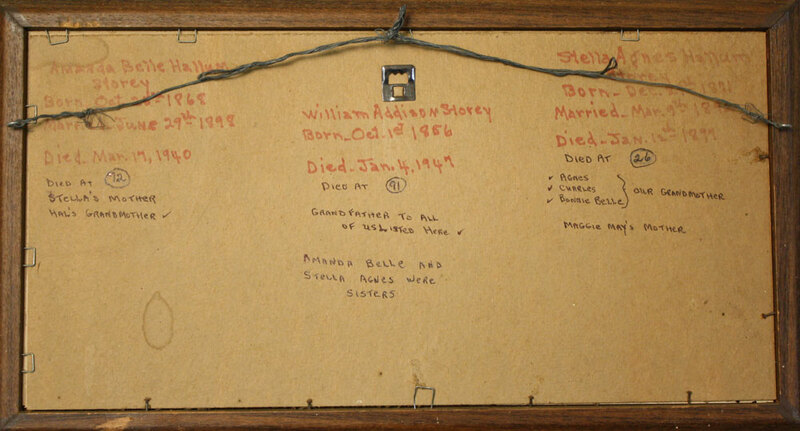 The back has an incredible amount of information written on it - obviously by someone who cared about documenting family. There are 3 pictures total in this single frame. From left to right - Stella Agnes Hallum Storey (1871-1899), William Addison Storey (1856-1947), Amanda Belle Hallum Storey (1868-1940). It was found in an antique store in Tyler, Texas, Feb 2009. Bigger picture of back. Bought at an antique store in Arcadia LA Jan 2009. The post card was sent to Sadie Jahnke - Tripoli, Iowa. Writer of the post card is A.W. and mention's Paul - possibly a husband. Bought this pic at First Monday Trade Days in Canton TX Jan 2009. Back of this pic says "My Mother - Elizabeth Frances Ruark (Tillotson) - Born Dec 2, 1859". A little research indicates she is probably wife of Charles Edwin Tillotson from Butler Kansas, and that she is daughter of John Ruark of Linn Co KS. Mrs. Tillotson died December 17, 1899. Bought in an antique store in Palestine Texas, Dec 2008. Back of this pic says "Jas Cowgill standing". Des Moines, IA. Bought in an antique store in Palestine Texas, Dec 2008. Back of this pic says "Hugh McCusker" From Troy N.Y. I bought this picture from a guy in Caballero Corpus Christi TX 4/08. The back has the name written on it. Haven't been able to figure out who this is even though I consider myself well-versed in Arricks. This picture was found at a junk store in GladeWater, Texas, 2008. The store is a block west of main street. There is a small label on the back that says "Duff Hunt". This picture was found at a junk store in GladeWater, Texas, 2008. The store is a block west of main street. The image is in bad shape and the envelope it's in has writing on the back I can't quite make out. It might say "Taken by A. H. Sewell"
This picture was found at a junk store somewhere in Texas, 2008. The back says "Woodsons Aunt, Julia Hood Shively & husband Jake & little George"
I have a shoe-box full of old letters, pictures, newspaper clippings, and WWI, WWII postcards (France Germany) from the estate of Archie McDavid, Mrs James Edwin McDavid, Beulah McDavid, Abilene TX. I bought this picture in an antique store in Tyler TX 2008. They had more pictures of this family in the stack. On the front is says "Kimball Girls" and the girls have these names: Sadie Kimball, Sarah Kimball, Annie Kimball, Mary Kimball. The back is blank. Bought in an antique store in Texas, 2008. The back says "Mr. & Mrs. Henry Reagle (Wedding Picture)". Bought in Texas, 2008. This is a great picture because it has the date (1906), the location (Stewardson, ILL), and all the names, and each person is numbered. Names: Deward & Ralph Williams, Mildred Adams, Alberta Adams, Erma Swingle, Vida Williams, Margaret Swingle, Soloman Swingle, Eva S. Manhart, U.A. Swingle, Ada S. Williams, Maria S. Carrick, Will Adams, Mamie S. Adams. See the Back here. Bought in Denton Texas, 2000. The personal wallet of Dr. T. J. Means of Prundy MO. Apparently he was a Doctor around Neosho Falls in 1872, and in 1874 moved to TX. Hello, I think you are doing a wonderful thing! I was searching for information on my family line and found your post about a tintype of J. Wilson. It's possible it might be my g-g-grandfather, James Ramsey Wilson.